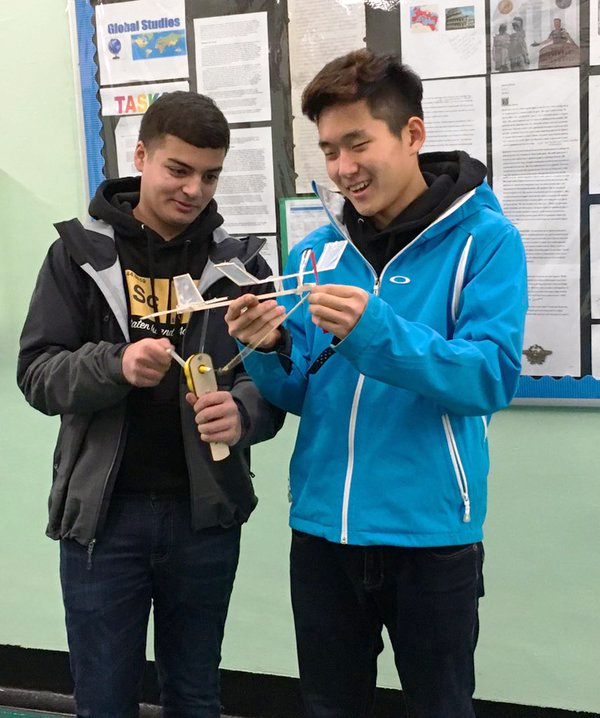 On Saturday February 6th, 2016, Staten Island Academy’s Science Club left campus at 5:30 AM and travelled all the way to Grover Cleveland High School in Ridgewood, NY to compete in its annual Science Olympiad. This was only the Academy’s second year competing, being that the Science Club just started two years ago, and even though we are still developing as a team, we did a phenomenal job. Last year, which also happened to be our first year competing, Wesley D, ‘17 and Ryan A. 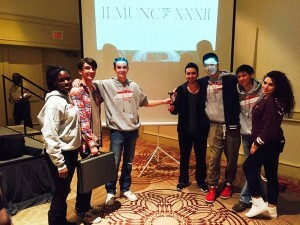 ‘17 earned 10th place in the competition, “Write It. Do It”. In this competition, one teammate has to write a procedure to an experiment that the other teammate will use to complete it. Competing against schools like Stuyvesant, Brooklyn Tech, and Staten Island Tech is not easy, but with our determination and diligence, we did it. This year, the Academy won two awards, one in “rite It. Do It” and the other in “Electric Vehicle”. In “Write It. Do It” Wesley D. ‘17 and Ryan A. ‘17 earned first place and in “Electric Vehicle” Wesley D. ‘17 and Trip M. ‘17 earned eighth place. Both of these events had around forty-five teams that competed and to place in the top ten, earning a medal is a great accomplishment; especially given it was only our second year. Even though it was the students who won the awards, the only reason that the Science Olympiad ran so smoothly was because of our dedicated faculty members. On this past Olympiad, we had Mrs. O’Hara, Mrs. Meyer, Mr. Wollney, and Dr. Ward accompany us on the trip. This was sadly Dr. Ward’s last Science Olympiad being that it is her last year teaching at the Academy. She was also willing to share her experiences and said, “By far what I love the most about Science Olympiad is hanging out with all of my students and doing science outside of the our normal classes. The club really felt camaraderie this year. Each open lab was so relaxed and simultaneously buzzing with activity. This year I learned a great deal about self-propelled airplanes and electric cars and watched in awe as Philip and Patrick hit target after target with their air trajectory device in the atrium. Science is always fun for me, but spending time with my students while they show me their love of science is something I will always cherish.” Overall, the Science Olympiad is a fun event and hopefully we do as well next year as we did this year and enjoy the experience at the same time. 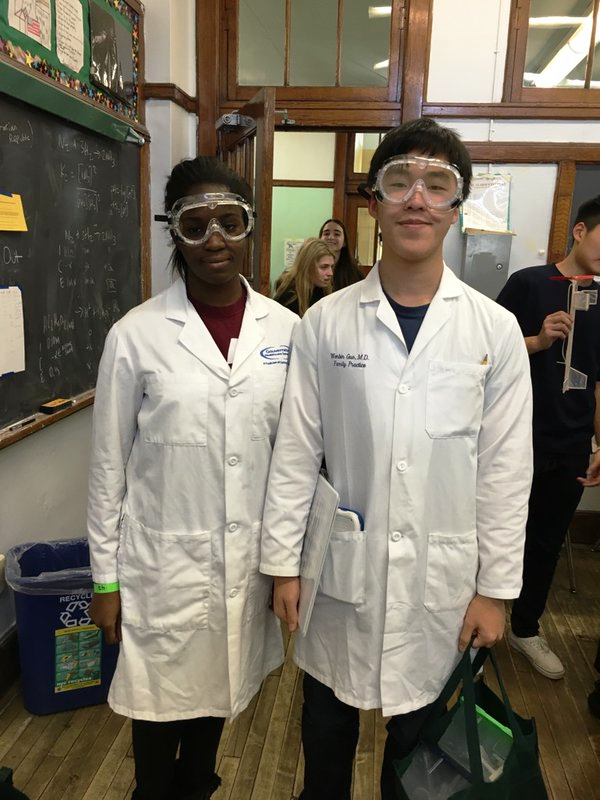 This entry was posted in Student Life and tagged dr. ward, science olympiad on February 25, 2016 by The Quill Editors. Mrs. Caren Platis has been leading the Model UN club at Staten Island Academy for 18 years! As a rookie participant for the most recent Model UN Conference, it was amazing to see the results of the hard work and commitment she has put into this program over the years. 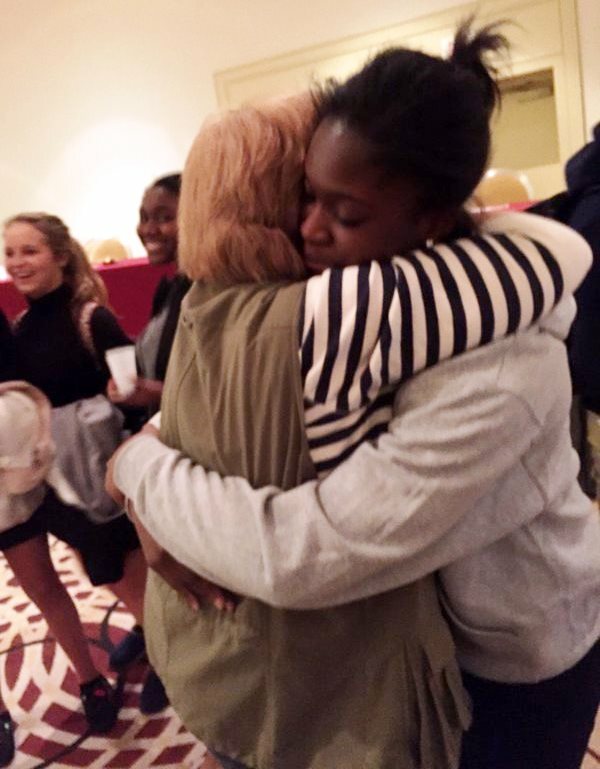 All of the students are grateful and appreciate of everything she has done to make this program one of the best, which led to the assembly of SIA’s largest delegation in 25 years. Mrs. Platis put her “all” into every mock session, every paper she read and re-read, and every conference she led. Of course I had to ask Mrs. Platis what memory stands out to her the most throughout her 18 years of leadership. Her all-time favorite Model UN memory was when she and Mr. Weissman took a small delegation to Beijing, China in 2010. For this opportunity, they brought ten delegates who competed among 2,000 other students mostly from other Asian nations. There were two awards won among the ten SIA students, which made Mrs. Platis and Mr. Weissman very proud. Many people associate the city of Philadelphia with their famous Philly Cheesesteaks. Another fond memory Mrs. Platis has is the “Cheesesteak Eating Contest” they held for several years. One student ate a total of 10 Philly Cheesesteaks in one weekend. It is important to note the record is still unbroken to this day. Perhaps someone will break it next year. 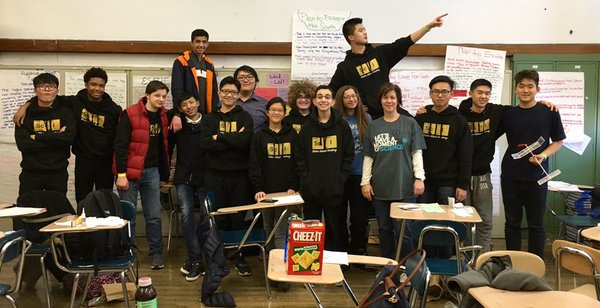 Looking ahead, Mrs. Platis feels the best years of SIA’s Model UN will occur in the future, but I think we all know some of the best years and memories were experienced with her at the helm. I also asked Mrs. Platis what legacy she hopes to leave for the club and the next Leadership Team. She responded by saying that she hopes that she has, “instilled a sense of stewardship and honor” in everyone. Mrs. Platis also said that she always asks the leaders to leave the program better than they found it. I am sure that Mrs. Platis has made every Model UN a memorable one that is never to be forgotten. 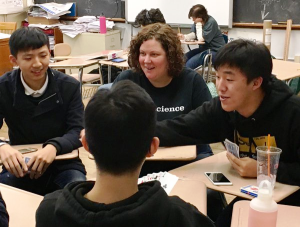 Something Mrs. Platis also shared with me is how grateful she feels to have been accompanied by Mark “the Bone-Crusher” Weissman who would sit with her in the hallways late into the night and make her laugh until she cried. Mrs. Platis will always be our fearless Model UN leader and we hope to live up to her legacy in the years to come. This entry was posted in Community, Student Life on February 18, 2016 by The Quill Editors. Model UN was a weekend filled with scintillating debate, hours and hours of conference, and loads of fun at the infamous Delegate Dance. As a rookie, I went into Model UN just hearing about it from the people who went in the previous years. However, I definitely wasn’t prepared for what I walked into late Thursday night. I watched as people entered into committee with stacks upon stacks of research, speeches, resolutions, etc. I soon realized that Model UN was more than the average person would consider a “club”. In order to be successful, you must research your given topic thoroughly until you know it like the back of your hand. Not only do you have to do research, but you must abide by the conditions assigned to you by your committee. That may mean representing a country you’ve never heard of before or having to place yourself back fifty years to when the committee was dated. The committees range from ten people in a Crisis Committee to two hundred in a General Assembly. The competition is intense and all countries must be able to speak on their feet and quickly think of answers to questions being asked of them by countries with opposing ideas. As the committee sessions pass, the goal of the committee is to formulate a reasonable solution to the problem at hand. During the last day of committee, countries must vote on resolutions that clearly maintain order between all nations. 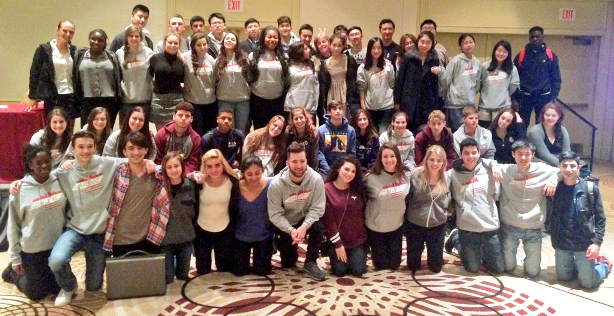 Staten Island Academy’s delegation was the biggest yet, with about fifty-five kids. While all of our delegates were outstanding, there were two in particular who received accolades for their contribution to debate. 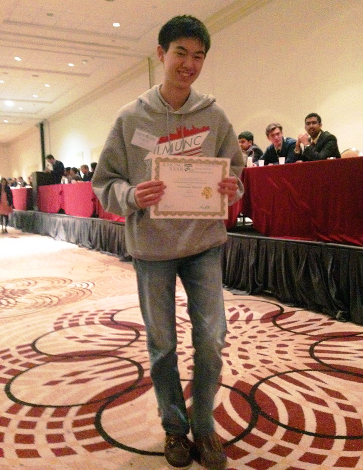 Trip M’ (Grade 11), won Outstanding Delegate in his committee about Pontiac’s Rebellion in which he represented Shawnee. John H’ (Grade 12) received a verbal commendation for his contribution to debate in his committee as well. Yes, hours (19 hours to be exact, I counted) of committee got to be extremely exhaustive towards the end of the weekend. 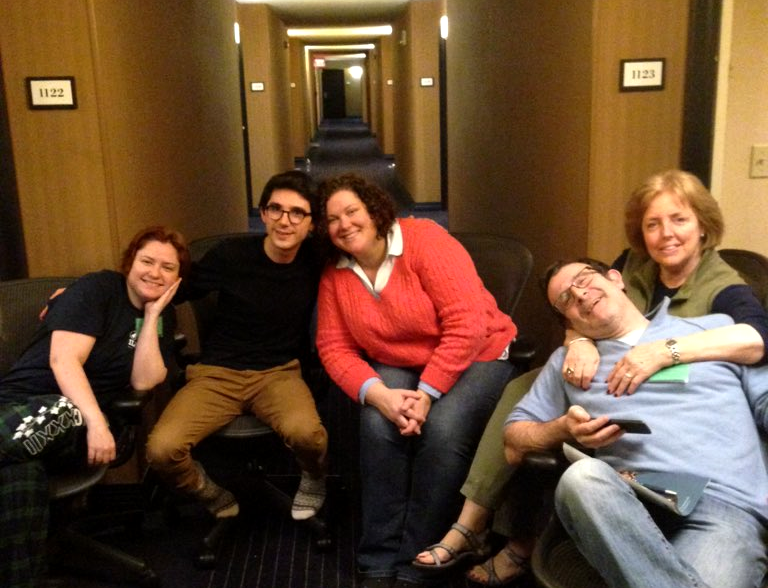 However, the weekend was not purely filled with sitting in a room discussing politics. On Friday and Saturday night, the Model UN staff provided fun events for delegates to attend after a full day of working hard. While the Delegate Fest was a fun, low-key event, the Delegate Dance was the main attraction. On Saturday night, hundreds of delegates piled into a ballroom and danced with friends they had gotten acquainted with throughout the weekend. It was a great way to end the event with a little hard-earned fun. 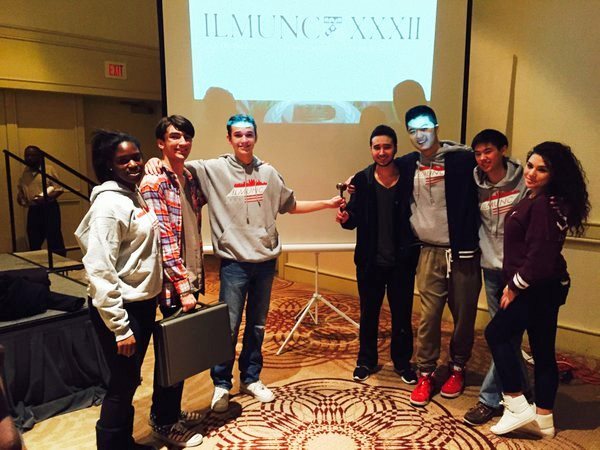 MUN 2016 will be one to remember, not only because of all the fun we had, but because it was Mrs. Platis’ last year as moderator. Mrs. Platis has been doing Model UN for over twenty years and her last one was surely eventful. From a rookie’s point of view, I can truly say it was a great learning experience for me and I cannot wait to be back at Model UN next year! This entry was posted in Community, Student Life and tagged Model UN, Mrs Platis on February 9, 2016 by The Quill Editors.